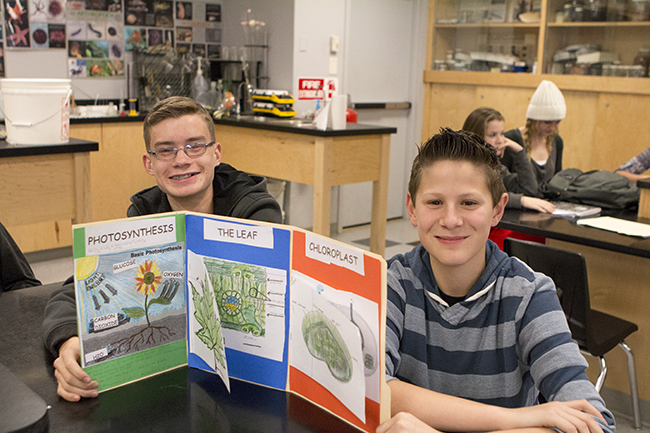 Nathan Mount, ’18, left, and Jaden Ventura, ’18, created a folder explaining how photosynthesis works, Jan. 28. Sophomores Nathan Mount, left, and Jaden Ventura create a folder explaining how photosynthesis works, Jan. 28. In Karen Walter’s 3rd period biology class, her students learned about how plants use photosynthesis by drawing pictures to describe how it works. For more photos, visit Friday rally and Superbowl spirit day. In the third Spanish installment for The Feather in the 2014-2015 school year, bilingual writer Justin Houts will be discussing the end of the first semester and the start of Christmas vacation. Spanish teacher Karen Almaraz leads the class discussion on verbs, Sept. 3. For the previous installment, read the Sept. 2 article, Estudiantes con herencia hispana comparten historias, hablan sobre tradiciones. En el fin del primer simestre los estudiantes piensan sobre que aprendieron. En la clase Espanol III, los estudiantes practican su espanol y lo usan en conversacion en clase cada dia. Los estudiantes ansian usar sus habilidades linguisticas en el mundo real. Julian Castro, 17 ‘, dice que sus mejores recuerdos de la clase de espanol estan practicando conversacion con otros estudiantes. A partir de mediados de ano, Karen Almaraz espera que las clases de espanol continuaron donde Senora Beatriz Foth termino. Ella espera que los estudiantes puedan salir de la clase con el mayor conocimiento posible. Algunos estudiantes toman la clase de espanol porque ellos tienen que hacerlo. Pero otros toman la clase porque les gusta. Alli Breedlove, 16′, dice que la clase de Espanol III es un de sus clases favoritas. En los Estados Unidos hay mas y mas personas estan aprendiendo a hablar espanol todos los dias. Es inevitable que el aprendizaje de espanol para trabajar y las oportunidades de trabajo se haran mas y mas util. This writer can be reached via Twitter: @JustinHFeather. For more features, read the Dec. 10 article, Children’s Electric Christmas Parade celebrates 27th anniversary, attracts sizable crowd. November’s student of the month is sophomore Katy Blankenship, chosen by science teacher Karen Walters for her devotion to academics and compassionate personality. In addition to her diligence in the academic sphere Blankenship is a member of California Scholarship Federation (CSF), Sister to Sister and Spanish Club. She also intends to join Creative Writing Club this semester. Blankenship says she participates in these clubs and activities in order to take full advantage of the opportunities placed before her. For Blankenship music has always been a significant part of life, with her mother bringing her to classes at an early age. Throughout, the years she has developed a passion for the art and continues to improve her skills. Due to a hectic schedule Blankenship no longer takes piano lessons. However, the music enthusiast attends vocal lessons weekly and is currently a first year member of FC’s Adoration Ensemble. Blankenship says that ensemble provides a place to both interact with friends and pursue her passion for music. Blankenship prefers to sing and play classical music, although, she appreciates a more modern indie style in her personal library. She considers her favorite artists to be Christiana Perri and Yael Naim. For Blankenship, music is an outlet for self expression, a way to praise God, gain confidence and find peace simultaneously. Another of the underclassman?s main interests is the outdoors. Blankenship currently lives at the base of the foothills and enjoys hiking, horseback riding and fishing during her free time. Blankenship and her Dad often spend a day hiking and fishing at Hume Lake . Blankenship believes her affection for the outdoors resulted from her parents’ own enthusiasm for all things involving nature. Close Friend, Caitlin Gaines says that Blankenship manages to balance school work and social life while remembering to be imaginative and funny. Blankenship considers herself to be an animal lover with four dogs, a rabbit, a guinea pig and a hamster. In the future she hopes to specialize in animal science or biology. Blankenship is interested in (Texas Christian University) TCU and Fresno State although, she is unsure about the high temperatures of the two locations. Ultimately she hopes to unearth something new and beneficial. A family is also among Blankenship’s plans. Follow The Feather via Twitter: @thefeather. This writer can be reached via Twitter: @skylerklee. For more features, read the Nov. 21 article, Students reflect on the privilege of driving, pros and cons. 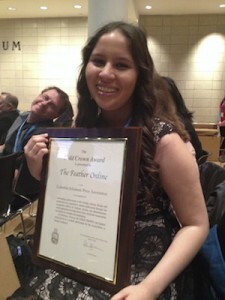 Last year, editor Viviana Hinojosa and The Feather staff won the CSPA Gold Crown. This year The Feather Online is a finalist. For the 7th year in a row, Columbia Scholastic Press Association at Columbia University in New York City, has named The Feather Online as one of the 2015 Digital Media Gold Crown Finalist, Nov. 10. Nominees of the Digital Media Crowns are considered the best examples of scholastic media in the United States. Over 1,400 digital newspapers were eligible for the award which honors the top papers in the country, regardless of size, division or state. The Feather is one of 14 online newspapers named in the Digital Publications category as a Gold Crown Finalist nomination. Other nominees around the country include: The Clarion, FHNToday.com, Inklingsnews.com, King Street Chronicle, Livewire, My Jag News, Southwestshadow.com, The Chant, The Eagle’s Tale Online, The Foothill Dragon Press, The Paly Voice, The Pride Online, The Red Ledger and The Rider Online. The CSPA awards its finalists with either a Silver Crown or to distinguished medias, a Gold Crown at the CSPA’s 91st annual Spring Scholastic Convention, March 18-20, 2015. Other categories which the CSPA nominates, along with Digital Publications, such as Yearbook, Magazine, Print or Hybrid are also selected as crown finalists during the year. Last year, The Feather received an All-American critique from the National Scholastic Press Association (NSPA) and a CSPA Gold Crown. Editor-in-Chief Sara Peterson, ’15, was hesitant about this year’s staff participation, but surprised by the outcome. Editor-in-Chief Chloe Mueller, ’16, feels excited that the staff’s effort has been effective. Senior Editor Ryan King was elated after hearing the news and motivated by the staff to keep up the momentum while facing the challenges this year has offered. A number of editors and adviser Greg Stobbe are planning a trip to New York City, where they will attend the CSPA conference and await the announcement of Crown awards in mid-March. They hope to receive an annual critique from CSPA. Please return to this article for an update. For more news, read the Nov. 10 article, BRIEF: 95th Annual Veterans Day Parade honors Coast Guard, Nov. 11. 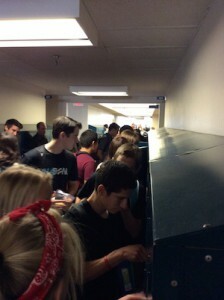 The mini-ballot was originally created by Sectary of State, Debra Bowen and Superintendent of Public Instruction, Tom Torlakson in order to inform the younger generation of the importance of politics in modern day society. On October 28, students gathered in their Tuesday advisory sessions to vote in the My Vote California Student Mock Elections. The mock election mirrors California’s general election (Nov. 4) and is offered to public and private schools across the state. Leadership advisor Robert Foshee says that the election was designed to spark a genuine interest in political issues within the student body and introduce them to the voting process. The impact and implications of each proposition were explained in detail by leadership members before students cast their ballots. Individuals were not required to vote but were highly encouraged to do so and rewarded with an ‘I voted’ sticker upon the completion of their ballots. Leadership student Juliana Rosik, ?16 says that the election served to alert the student population of state-wide issues. Although she doubts the results will be accurate due to an observed lack of seriousness from the student body. Sophomore Daniel Ayres decided to vote because the issues presented interested him. He is curious at the outcome of the election despite a lack of previous interest in general politics. Senior Jonathan Brushwood, noticed that some results did not follow that of the state election. He was surprised at these abnormalities and accredits them to a teen population not aware of national issues. For other county and individual school results visit Myvote Student election.com. For more features, read Nov. 4 article, Photojournalism advisor adjusts to new position, offers professional experience. 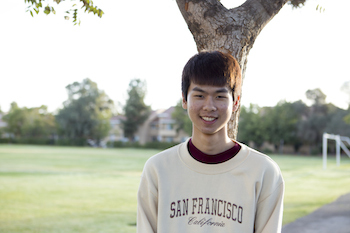 Metanopphakun journeyed to America from Thailand about two years ago in order to better his English skills. He believes that exposure to American culture will increase college and job opportunities within his own country. Every month The Feather will highlight one student recommended by a teacher and voted upon by staff members. Students are chosen depending upon several factors including and not limited to good grades, class engagement, positive attitude and special extracurricular activities. The student of the month of October is foreign exchange student Krit Metanopphakun, chosen for his hard work and positive attitude by math teacher and Director of Academics, Michael Fenton. Upon his arrival, Metanopphakun noticed a distinct change in cultural norms, student teacher interaction and freedom of speech. He says that he enjoys the difference between the two cultures and revels in new found liberties here in the US. As a foreign exchange student Krit has encountered and continues to encounter several challenges typical of international students. In addition to the new atmosphere, language and culture he is separated from his friends and family in Thailand by thousands of miles. On his spare time Metanopphakun also enjoys watching movies, listening to music and hanging out with friends. His favorite sports are badminton and volleyball. He expresses great disappointment at the fact that FC does not yet have a male volleyball team. Fellow foreign exchange student Olivia Tandadjaja, ’16, has become friends with Metanopphakun over the last few months. She says that he possesses a quiet but unique humor. Metanopphakun enjoys both English and math at FC. He credits his appreciation of the subject to the insightful teaching methods used in the classes. 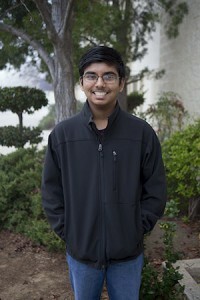 After High School, Metanopphakun plans to return to Thialand, where he will attend a four year college and then determine his future profession. For more features, read the Oct. 16 article, Get to know: Trevor Trevino. All factual information in this article is product of the College Board Website. The Scholastic Aptitude Test (SAT) is a comprehensive assessment of a student?s critical reading, writing, and mathematical skills. It is offered in the US seven times a year in Oct., Nov., Dec., Jan., March, May and June. Internationally (outside of the US) the test is offered a total of six times per year. The next SAT will take place at 8 a.m., Saturday, Oct. 11. The deadline to sign up for this session was Sept 12. However, one may still be eligible if signed to the waiting list.
. General attendees of the SAT are college bound junior and senior students. Nearly half of these participants take the test at least twice and generally improve upon retaking it. Jordan Castro, ’15, is retaking the SAT this Saturday, Oct. 11. Despite his initial fears, Castro hopes to improve his overall score and further bolster his college application. 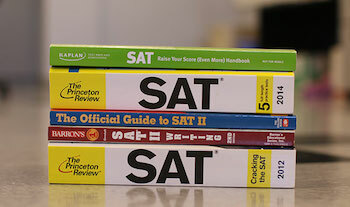 The SAT is considered in the college application process among a number of factors including and not limited to, high school grades, GPA and extracurricular activities. The weight of these individual factors depends upon the particular school’s standards and requirements. To search the SAT requirements for colleges of interest the College Board has provided a School Search on their website. Senior Zach Smith, ’15, is confident about his next attempt at the SAT and plans not to study. Students are encouraged to take advantage of several study methods including the Pre-Scholastic Aptitude Test (PSAT); Prep courses, and free online resources. However, such preparation should also be supplemented with practical in class experiences and hard work. Junior Morgan Miller will be taking the SAT for the first time in this next week. Over the last few months she has prepared for the ACT and hopes that her studies will benefit her in future tests. She fears that the stress of the experience may cause her to forget key information. However, Miller is consoled by the realization that she will have the chance to retake it. 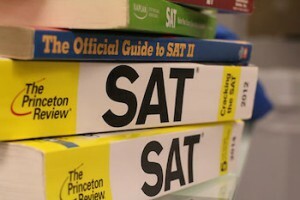 The SAT is graded on a 2400 point scale with 200-800 points per section. A fraction of a point is subtracted for all wrong answers except for questions entered into a grid format in the math section. There is no penalty for unanswered questions. In the spring of 2016 the SAT is scheduled to be reformatted. Some of the future modifications include greater focus on the meaning of words in context, interpretation of evidence, analyzation of a source, applicable math sections, real world contexts, social studies and US founding documents. The redesigned SAT will not penalize wrong answers. For more news, read the Oct. 1 article, Annual Grandparents Day set, Oct. 3 (VIDEO). Although our generation has gained the label as the ‘communications era’ through social media, many of today’s students are growing less and less aware of current events in today’s society. The Association for Education in Journalism and Mass Communications (AEJMC) has created News Engagement Day (NNED) and is sponsored by Journalism Education Association (JEA) in order to increase student involvement in news media. The Feather staffers have spent time spreading awareness for News Engagement Day and it’s purpose throughout the halls of their school. The Feather editors hosted a press conference after chapel on the steps of Building 6 to show support for National News Engagement Day. With seniors John Dooman and Trevor Beal providing opening comments on the reason for the day, Editor-in-chief Sara Peterson and senior editor Ryan King continued by encouraging those in attendance to know why engaging with the news is important, namely to be empowered and to protect our civil liberties. Finally, The Feather is a source of local news for campus students. Those in attendance heard five reasons why the editors hoped their peers would engage. Without a school population and sharing their voices, there would be no Feather. The Feather is one way students can connect with campus news and events. The Feather would like to encourage students to submit their opinions on National News Engagement Day and it’s effects on students. Any responses are appreciated in the comment section. The Fresno Bee covered #NewsEngagementDay and featured the campus students later in the day at Fresno Christian celebrates National News Engagement Day by reporter Hannah Furfaro. NNED means that we are raising awareness of the importance of news and no matter what age you are, news will always pertain to you. Involvement with the news is important to highs school students because, there is no harm in not knowing what is going on. We, as young people need to start developing opinions and diving in to the real world. When I’m in world history we always have to research the news and I usually go to BBC. I like to look at the sports section on The Feather because thats what I’m in too. Students should definitely get involved in news media because they need to establish their own beliefs and not just follow their parents. The National News Engagement Day means we could go back to the old age and start to care about the world around us once again. In Mrs. Friesen world history class, students check on the world news every Tuesday, and that’s how we get involved in news media. As we raised the awareness of the news, we will truly understand what it is happening in this world. The world that we are live in might seems peaceful on the surface, but once we to dig into the news. We realize the war in Syria and Ukraine and the Ebola in Africa. The world that we live in is not as save as it seems like. My favorite news station is ABC 30 because I can just go on at anytime and see what is happening in my community. My favorite section on The Feather is the sports section because I like how I can go and see how the teams are doing. High school students should be informed on local news along with current campus news. I think it is important to raise awareness of the news because the news is being ignored partly because it has always been there. If people do not know what is going on in the world or the news they might repeat what has occurred in the past. I do think it is important for high school students to be informed of the news. If high school students go out into the world outside of school and do not know what is going on in the world, we will look like we don’t care and are uneducated. I think News Engagement Day is a time where we as people focus our time in whats going on locally, politically (even though its so confusing), in our country, in the world, etc. I think it’s a good time to see what we do and why we do it. I think high school students need to know at a young age what’s going on so when they are older, they know what’s going on and they are aware of their surroundings. Well this is my first year being a part of The Feather and my main job is writing the volleyball sport shorts. I do my best to make people more excited to come out to the games and increase school spirit. I think it is always better to be more aware of what is going on at school and around the nation. Personally, I feel like I am more a part of the school and I am a better citizen. I like to use my cell phone to look up news because it is a faster way to retrieve news. In my history class, we go online to news websites and read articles and then talk about them in class. In doing this, we are able to get a better perceptive of world news. NNED pushes students to read about news around them, including their online school newspapers. Instead of students looking at their phones for news, they can look at their own school newspaper. Me and my dad listen to KMJ on the way to school with my dad because he wants to know whats going on in the world. My favorite section of The Feather is the photo section because a picture is worth a thousand words. I think National News Engagement Day is important because not a lot of people watch or pay attention to the news, so some don’t know much about what’s going on in the world. It also can show how important it is to be informed about current events. Now that I’m in journalism, getting involved will be a good way to see how the news uses social media to spread stories quickly. I think that news serves to unite us as a community. There is something about understanding the issues that are at hand, the people who serve us and those who have been under looked for so many years that draws people together. For high school students, news not only applies to the overall community but to the school itself and to each individual. The purpose of a school paper is to highlight every person and give a sense of belonging to even the most socially removed. This is why engaging in news is so important. I think that NEE is important for those who only refer to non-news media to get news. Too many people rely on Twitter and Instagram for today’s news, leading to bad rumors, and incorrect beliefs. An awareness day like this is necessary for those many teenage students to refer to better sources. I like to look at the news on Twitter because I follow the BBC and CNN. My favorite section on The Feather is pictures because I enjoy photography. It’s important for students to be up to date in current events. I think news Engagement Day is important to me because it is something that doesn’t get noticed that much and it shows a better understanding of a journalist’s purpose. I think it is important because it can show people how the news is actually important and how it can better peoples lives. The AEJMC and NNED can be reached via Twitter: @AEJMC and @newsengagement. The official hashtag is #newsengagementday. These writers can be reached via Twitter: @_sarapeterson and @_chloemueller. Follow The Feather via Twitter: @thefeather. For more features, read the Oct. 6 article, Annual event provides grandparents with campus experience. Many campus graduates find that their most influential moments were made while attending FC. Former alumnus, David Casuga, discovered his passion for music and percussion during his time spent at the school. Casuga now teaches jazz band and percussion; he is majoring in jazz performance. He began his musical career as a percussionist and has enjoyed percussion in general. His goal as a teacher is to assist the percussion program towards growth into an impressive program. While teaching at FC, Casuga attends Fresno State. He is involved with band classes and even plays a few instruments in the Fresno State Band. After graduating, he wanted to give back to the program that inspired him. He enjoys being able to teach a subject that he himself is passionate about and hopes to impact his students to grow to love music as he does. Former student percussionist, Andrew Guthrie, ’15 awaits to become better and to play with the rest of his drum team. Not only did Casuga dedicate his heart towards the music program, but also towards The Feather. 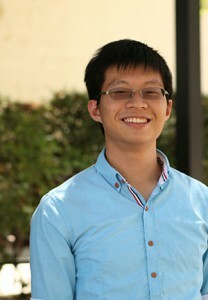 Throughout his high school career he served as the newspaper’s webmaster. While in the journalism lab he strived to carve his work ethic into perfection. Emily Cox, ’19, looks at working with older classmen as a building block to success. Casuga took a moment to look back and describe the unique ways that his school community changed his life. Casuga treasures how FC offers exclusive opportunities and challenges, which differentiates it from other schools. From the students’ perspective, he saw what set FC apart. Every day Casuga gives thanks that he is a part of a program that he loves. He can’t wait to see what the music program conducts in the future. Follow The Feather via Twitter @thefeather. This writer can be reached via Twitter @jennypenny8835. For more features, read the Sept. 23 article, Guest speaker tells story, delivers powerful message. 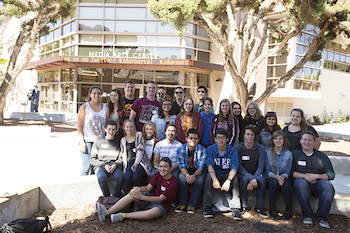 The Journalism staff poses in front of the Paly Voice building after their time spent at J-Day. On an early, dark Saturday morning, The Feather staff loaded up on a charter bus to head to Palo Alto High School for Journalism Day (J-Day) hosted by high school publication, The Paly Voice. Staffers of all ages prepared for a day of learning from some of the nation’s best journalism advisers, Sept. 27. At 10 a.m. staffers unloaded from the bus and headed into The Paly Voice’s new multi-million dollar media building. Equipped with a schedule of available classes, students spread far and wide to not only learn, but also to document their trip. 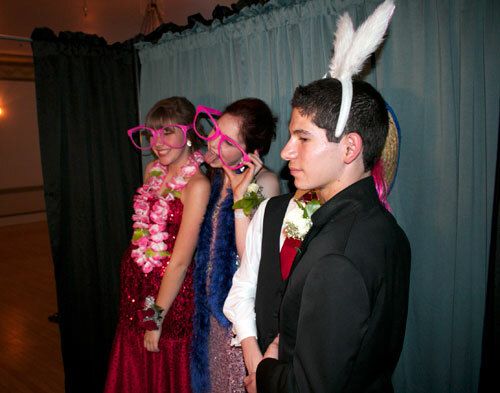 The Paly Voice is a student-run high school online publication for Palo Alto High School. The Paly Voice was a winner of The Pacemaker, a national award given by the National Scholastic Press Association (NSPA), in 2013. The Paly Voice also earned a high school digital publication Silver Crown from the Columbia Scholastic Press Association (CSPA). Many believe that The Paly Voice has set the standard for high school journalism over the last decade. Paul Kandell, The Paly Voice’s head adviser, took a moment to speak with Feather staffers. Kendall believes that J-Day will transfer skills from The Paly Voice to interested students from other publications, and will make a large impact in the journalism community. I think its incredibly important to encourage young journalist even though its no the glamorous job or where you will make the most money and its not the easiest path forward. It’s amazing to see so many kids interested in it.–Elena Kadvany. The Feather also collected quotes from Palo Alto students on campus. One student, who chose to stay anonymous, believed that the purpose of the J-Day was to host an event in the new journalism building. Multimedia specialist, Callista Fries, ’15, learned during the trip that many schools place a higher focus on sports than on school life in podcasting. Fries also reported that J-Day inspired her to try a new spin on her own multi-media. Freshman and first-year publication student, Devin Pitts, shares his impressions of The Paly Voice along with J-Day. Elena Kadvany, keynote speaker at J-Day, is excited to see the growth in young journalists. Rachel West, current Journalism Education Association Northern California (JEANC) president, provided insight to the importance of J-Day. Sara Peterson, Editor-in-chief, Trevor Beal, News Editor and Rees Roggenstien, Opinions Editor, also contributed to this article. Follow The Feather via Twitter @thefeather, Instagram @thefeatheronline and Facebook @thefeatheronline. This writer can be reached via Twitter: @_chloemueller. For more news, read the Sept. 26 article, Small town fair hosts campus band. For many freshmen college tends to be viewed as a matter to be dealt with in latter years of high school. However, students have the potential to prepare for college even in their first year. Through a collection of simple steps, a student is capable of developing skills and plans in the present that will aid them in the future. Freshman grades do affect a student’s overall college Grade Point Average (GPA). Although, some colleges focus on the last three years, more competitive colleges observe freshman year as well. The GPA of a student who receives C’s and D’s freshmen year may be significantly lower than one who gets A’s and B’s. A student who has an academically shaky first year of high school can still be accepted to a quality college. However, the road there may be more difficult due to the time lost. Early preparation for college may enable one to have less stress as an upperclassman. Therefore, this year provides a time to pursue interests and find subjects that one is passionate about. Colleges approve of a well-rounded student with academic, athletic and social talents. Yet at the same time, students need to prioritize their schedules and refrain from over commitment. After all it is better to succeed in a few things then struggle in many. The level of participation possible depends on the individual. Since high school and even freshmen year is cable of causing students to develop habits that affect them in college, it is important to create the right ones. All students need some amount of time to complete their homework, study and reflect on academics. However the way each person does this and for how long depends on the individual. For example some students require complete concentration in silence for long periods of time while others prefer shorter sessions of concentration and more frequent breaks. A study habit applicable to one?s personality and dailey schedule may aid them significantly throughout their high school career. Most colleges look favorably upon students who take college prep classes in high school. These courses serve to prepare students for the amount and quality of work expected of them in higher education. It is important that one take core classes as freshmen in order to optimize time, future options and meet all high school requirements. Students should plan out a plausible road to college so they can clearly organize their thoughts and options. This may require the aid of one?s guardians. Students may want to ask their guardian?s opinions about college budget, location and other factors in order to aid in their selection.Parents may also share their experiences and guide one to make the correct choice in classes. If an individual is still confused or unsure of which classes to partake in they should seek an appointment with the schools guidance counselor. FC Guidance Consoler Michelle Warkentin says that the selection of classes that students choose freshmen year is essential to early preparation for college. She also states that the first year of high school prepares one for the next three, and higher education. Often a student falls behind in a subject due to comprehension issues or missed classes and needs some extra help. There are several different ways to find this help. It may be wise to consult parents, teachers or a tutor in order to understand a concept. Also, the internet, books and many other sources can serve as learning aids. Often the simplest resolution is to ask piers who understand the subject. Regardless, there are various resources that students can obtain to keep up with their academics. Summer provides three free months out of the year. These months can be used to get ahead and consider college opportunities. One way to prepare for college over the summer is to do volunteer work, or pursue a hobby. Again, over commitment and high amounts of stress are not healthy. However, taking summer classes, volunteer work or a sport is recommended. Although college is a few years away, freshmen have the opportunity to prepare in the present. The decisions made now can affect the future either for better or worse. Wise decisions, a good work ethic and determination can allow freshmen to take a successful first step on the road to college. For more features, read the Junior dedicates time, displays service qualities. Located next to China, Japan, Korea and Philippine, Taiwan is a tiny melting pot in Asia. The education system is much more complicated in Taiwan than here is in the United States. As children born in Asian culture, they are required by their parents to have many talents. Playing piano, playing violin, drawing, learning English, and doing abacus (math) are nothing special: just what students ought to be able to do. As students grow older, more and more homework is put onto their shoulders, Many students began to cram schoolwork in the 7th grade. Being able to get a high score becomes the only purpose of a majority of students’ lives. Going home late is a normal part of many junior high school students’ lives. Going to bed by 11 o’clock or later is normal, between ten and 11 is great, and before nine o’clock is almost impossible. There are only two periods of P.E. classes in one week, but pupils hardly participate in them. Students wonder why they need P.E. class when only two students in the class are swimming and the rest are sitting on the benches. 9th grade is the most important year for junior high students. Students study so hard that school seems like a graveyard after the sunset. As the exam comes closer, massive amount of tests and handouts are given out by teachers and schoolwork cram can stack up higher than five feet. In 2010, my sister Jane Fu took the last year test of the “The Basic Competence Test for Junior High School Students” in Taiwan. The following year the education system officials realized that there were too many mistakes in the scoring. The government decided to cancel the new test before the summer vacation was over. Recently, there was a student who scored nothing, but was accepted into the top three high schools in Taiwan. After students finish high school, another challenge is waiting for them. High admission rate almost makes college worthless. In 2008, Taiwan made the admission rate 97.1%, which allowed students to go to the college so easily that scoring 7.69 points was sufficient to go to college in Taiwan. As the result, young people with master degrees or even doctorate degrees could not find a job. News shows up day after day saying that doctors aren’t making money at the hospital of their professions, but instead from making food at the night market. For more features, read the Sept. 11 article, New coach brings excitement, energy to PE. All juniors are required to take the PSAT test this year. Warkentin says that it is the most useful resource for students who plan to take the SAT. Every year in the months of October and September, seniors and juniors across the country prepare to take the SAT (Scholastic Aptitude Test). On this day the PC Gym is laden with tables, chairs and in many cases nervous students. The test begins and pencils bubble in answer after answer. Below are the SAT and PSAT (Pre-Scholastic Aptitude Test) testing dates along with the best ways to study according to Academic Advisor Michelle Warkentin. Time: starts at 8 a.m.
Students should arrive at least ten minutes early. Worship Band member, Alexis Kalugin, ’16, plans to take the SAT in the spring. She says that she is apprehensive about the math and language sections. Warkentin recommends several programs in the Fresno area for those who have pre-test nerves or wish to increase their testing skills. One of these recommended programs is the College Planning and Tutorial Center. To sign up for the SAT, visit the The College Board. For more news, read Aug. 29 article, Student Leadership: Speaks out. As part of an ongoing assignment, Beatriz Foth’s Spanish III students will each be publishing at least one bilingual article per year, in order to highlight the skills they have accumulated throughout their studies. This first installment will focus upon hispanic youth and feature a number of FC students with Hispanic and Latino heritage. According, to the United States Census of the year 2013, 51.6% of Fresno County’s population is of Latino or Hispanic decent. 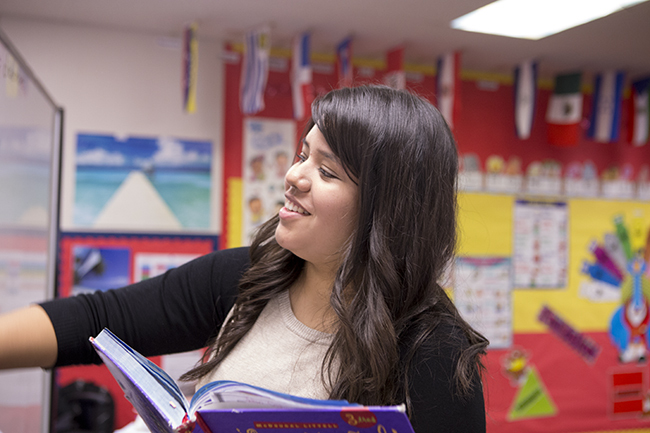 The growing numbers of Latino American households across the nation and especially in the San Joaquin Valley adds to the abundance of multi-cultural youths that reside within America. Lindsey Biehler es mitad mexicana y mitad caucasica. Ella dice que ella disfruta estar expuesta a las dos culturas. Los personas de descendencia hispana en el pais celebran muchos feriados y tradiciones que son unicos de su porpia cultura. Cinco de Mayo y el Dia de los Muertos son algunas de las fechas que son celebradas por muchas de la familias hispanas de los Estados Unidos. Julian Castro,’17 es tambien medio mexicano y medio caucasico. Aunque su familia no celebra todos las fiestas tradicionales de su cultura, ellos anaden un toque hispano a algunas de las celebraciones de EE.UU. El estudiante Timoteo Melendez,’17 y su familia tambien celebran muchas fiestas mexicanas tradicionales. Tambien hay muchos lugares y oportunidades para los jovenes hispanos de involucrarse con la comunidad. Iglesias bilingues en la zona de Fresno y Clovis tales como El Puente y la Iglesia Bautista El Encino son solo algunas de las iglesias que ofrecen servicios tanto en espanol como en ingles. En muchos casos, los jovenes de descendencia hispana no se sienten directamente afectados por su cultura. Para otros su herencia cultural tiene una gran influencie en su infancia y en su vida cotidiana. Macy Mascarenas,’16 dice que crecer en la cultura hispana ha sido siempre parte de su vida en el hogar y que llevo consigo durante su experiencia estudiantil. La multideportista Gaby Siqueiros ,’15 dice que su cultura hispana es un gran parte de su vida. Ella puede hablar el espanol con fluidez porque practica a diario en casa. Donn Rojeski was passionate about argument and debate at a young age. He dreamed of attending law school and one day becoming a lawyer, despite the difficulties of the profession. Beginning last year second semester, Donn Rojeski, formed the debate team, as an after school activity for students who were interested. This year, the team has grown into a elective that students can now take during school hours. Donn Rojeski was passionate about argument and debate at a young age. He dreamed of attending law school and one day becoming a lawyer, despite the difficulties of the profession. He stated that he knew in his childhood that rhetorical logic would become his lifelong ambition. Rojeski was born in Kearney, Nebraska to school teacher Doris Rojeski and her husband, Max. From an early age, Rojeski was interested in the art of debate. The majority of his friends were also rhetoric and law devotees. In high school, he and his best friend cultivated their skills by joining the debate club. Rojeski says he remembers the club as one of the activities he enjoyed most. After a quiet childhood and graduation from Kearney High School, Rojeski attended the University of Nebraska and Northern Illinois University where he studied debate. He then returned to Nebraska to study law. His education was interrupted in 1967 when he was drafted to Vietnam and trained to be a fire direction officer for the artillery. This involved both mathematical calculations of weaponry and providing coordinates to shooters on the field. He served for two years and was thankful to return to America at the end of that time. Unfortunately he developed tinnitus, a hearing condition characterized by ringing in the ears from his time of service. Rojeski says that his involvement in Vietnam left him with some very painful memories that are typical of many veterans. Upon his return, Rojeski earned his law degree and began to practice in government and private law. He continued this lifestyle for several years during which, he met his wife. Hallie Rojeski, current teacher of FC’s Junior High Leadership, bible and history was introduced to Donn by a friend who was dating one of his friends. They were married in Denver in 1972 This year will be their 43rd anniversary. Hallie says that having her husband work with her is a wonderful experience. Besides debate Donn and Hallie both follow sports. Donn is a long term San Francisco Giants fan and follows the Denver Broncos as well. He also reads an average of 100 books per year from a variety of genres. Donn decided to end his law profession soon after he and his wife became born-again Christians. He says that the moral obligations of Christianity often conflicted with the circumstances he dealt with as a lawyer. After several years working with Mennonite Brethren Church as an assistant pastor, Greek Instructor, and plan advisor, Rojeski retired. Recently he was contacted by FC about a teaching position. Due to his connections to the school, he was familiar with most of the teachers and culture. For Donn, it has been difficult to find students interested and able to take part in his debate class. He plans to teach some students independently. Rojeski says that it is imperative to establish a debate team and spark an interest in the class this year. Rojeski says that debate is an important class that will prepare students for both future courses and real life confrontations. For more information on FC debate team be sure to see Debate team to help improve critical thinking skills. For more features, read the Aug. 26 article Student run publications gives knowledge, resources to school. This year FC has introduced a Block Schedule on four consecutive days of the week. Students will have all seven classes on Monday. For the first time in the history of FC, students and faculty face the potential challenge and promise that comes with the introduction of a new bell schedule. 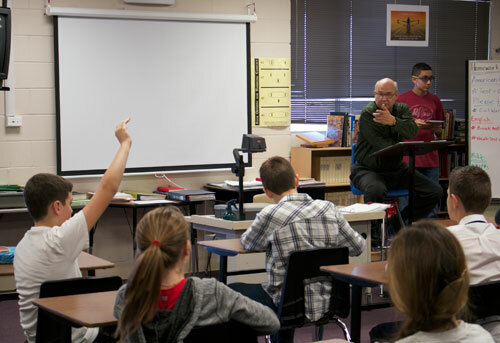 Differing from years prior, the weekly schedule for the ’14-’15 school year gives teachers the chance to instruct in block periods four out of five school days. FC students will take all of their classes on Monday and then alternate between periods 1 through 4 and periods 5 through 7 depending on the day of the week. This has caused some disorder in the minds of students who do not always know what classes to go to and what time to arrive at. Eighth grader Kamryn Shultz, dislikes the schedule because the order of the classes is confusing to get used to. The need for the schedule, while challenging to some, was evident according to Mike Fenton, Director of Academics K-12 and creator of the new schedule, according to Fenton the benefits of the schedule will match what educators and administration have in store for the school in the future. Already a few weeks into the school year some students prefer the benefits that the new schedule has to offer. Andrew Moore, ’16, enjoys the opportunity the schedule allows him to learn about subjects he is studying in more detail. Some teachers also enjoy having the longer periods because it gives their students a greater exposure to what they are learning and hopefully helps them grasp the concepts more firmly. Drama and choir teacher, Susan Ainley, also thinks that the schedule gives her more freedom to explore new concepts and it helps to encourage students to try harder in her classes. Fenton said that this was the ultimate goal of bringing in the new order of classes, to help both educators and students take their time in teaching and learning the specific subject matter. Publications improves students’ knowledge of social media, technology, and connects them to the community around them. Fall has arrived which means it is time for many students to sign up for new classes and clubs. For The Feather, it means recruiting new members. Unlike other classes, journalism teaches students how to become involved and reach out to their fellow classmates. Publications improves students’ knowledge of social media, technology, and helps them become extraordinary writers. Staff members are connected with the school in all areas, whether it be at school activities or school events. 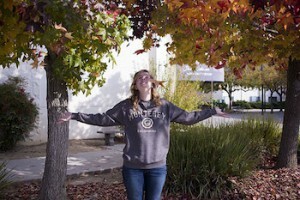 The Feather Online allows you to see Fresno Christian from an inside perspective. History teacher, Kori Friesen, believes The Feather enforces students to join the crowd and capture moments about others that not many people may know. Not only does publications teach its staffers to communicate but it also gives them guidelines that will improve their work ethic. Students are faced with situations like responsibility, working independently and deadlines that are in preparation for college. Colleges not only look at a students’ capability or GPA, but also club and extra activities. Superintendent Jeremy Brown , stresses that The Feather gives students more exposure to the world and to the community around them. Many high school students today use cell phone devices in their everyday lives. Publications encourages FC students to tag or hashtag The Feather via Twitter and Instagram. The hope is that this will help connect students to the school. All grades have access to school events and details at their fingertips. The digital portion of the program also teaches new learners how to stream audio and video from their cell phones. Podcasting and videos broaden the horizons for The Feather. Through podcasting, students can learn about student life and news on the campus. The Feather provides other avenues like videos and podcasts besides written articles. The new recruits acquire the knowledge of how to use Photoshop and macromedia programs. Students who attain these skills are able to use them in college. Superintendent Brown sees that The Feather class helps shy recruits become interactive with people of different circles. For more features, read the Aug. 21 article New teacher joins campus, community. Follow The Feather via Twitter: @thefeather. This writer can be reached via Twitter: @jennypenny8835. 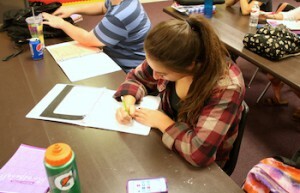 Gaby Siqueiros, ’15, works on her Cinco Al Dia as class starts. In my first Spanish installment for The Feather in the 2014-2015 school year, I will be discussing the start of the school year and how people feel about it. For more articles in Spanish, check out my profile, or look for other articles written by students in Spanish III. Al comienzo de un nuevo ano, los estudiantes tienen diferentes sentimientos sobre todo lo que esta pasando. Algunas personas dicen que ellos estan alegres de ver a sus amigos y sobre los cambios como los horarios differentes y las nuevas clases. Pero a otros no les gustan estos cambios. Beatriz Foth, una de las maestras de Fresno Christian, dice que tiene sentimientos encontrados sobre este ano. Ella dice que le gustan las clases y los estudiantes, pero hay aspectos a los cuales hay que adaptarse. “Este primera semana de clases ha sido interesante, divertida, pero bastante cansadora,” dijo Foth.”Mis nuevos estudiantes de espanol parecen ser Buenos chicos con interes de aprender un nuevo idioma. Nuevos estuduiantes vienen a Freno Christian cada ano. Este ano, muchos de los estudiantes nuevos son estudiantes internacionales de Asia. La cultura de Estados Unidos es muy diferente a la de Asia. Los estudiantes de Asia piensan cosas diferentes sobre nuestra cultura. Hoon Kim, 16, dice que prefiere Estados Unidos. Este ano, nuestra escuela ofrece nuevas clases. Una de estas clases es fotografia. La maestra de fotografia es Senora Friesen. Senora Friesen dice que esta muy emocionada sobre este ano. Otra diferencia de este ano comparado al ano pasado es el Director de la escuela. Despues de la salida de Tod Bennett, Amy Deffenbaucher, la maestra de ingles del ano pasado, ahora es la Decana de Estudiantil. Ella dice que es mucha responsibilidad y mas trabajo. A pesar de todos los cambios, el corazon de nuestra escuela es el mismo. La cosa mas importante de Fresno Christian es Dios. Eso nunca cambiara. Since the debate team is a new class offered, not many students have signed up so far. Debate teacher, Donn Rojeski, expressed the need for more students to join the team. Last year, a new program was introduced to the FC campus; the debate team. It began as just a club, familiarizing students with how to participate in a real life debate. This year, the debate team has become an official class available for students to take. The team will compete against other Christian schools in tournaments hosted all over California. Every year, a new debate subject is administered to the schools participating in the league. This year’s subject discusses whether or not the United States federal government should substantially reform its military policy towards foreign nations. In many real life situations, possessing effective debate skills may come in handy. Rojeski stated what he believes students can gain from joining the team. Rojeski is not the only one hoping to see more students join the team. Debate team member, Kathryn Damschen, emphasized the importance of other students joining. If there are any aspiring lawyers on campus who enjoy the occasional light hearted banter or someone who is just seeking the challenge of overcoming a disputed subject, the debate team may be the class for you. Any student who wishes to join the debate team should visit Michelle Warkentin in the academic advising office about how to join the class. Follow The Feather via Twitter: @thefeather. This writer can be reached via Twitter: @namoodnohj. For more news articles, read the Aug. 18 article: Seniors prepare for retreat, look to grow closer. Back-to-school night (BTSN) is an annual event held within the first few weeks of school, in order to welcome the start of the new school year, Aug. 18. Parents have the opportunity to reverse roles with their kids and spend some time in their classes. Back-to-school night (BTSN) is an annual event held within the first few weeks of school, in order to welcome the start of the new school year, Aug. 18. Parents have the opportunity to reverse roles with their kids and spend some time in their classes. Teachers also get to chat with parents and share their goals for the year. This year will be a special BTSN because there are many unfamiliar faces and a whole new academic plan. Parents will get to learn more about the technological changes undergoing at FC. BTSN will be held on two different nights, junior high and high school will be held Monday, Aug 19. Seventh grade parents will meet in room 629 at 6:30 p.m. and eighth grade parents will meet in room 628 at the same time. to discuss upcoming class trips. Grades 9-12 parents will meet in the FCS gym at 7 p.m.
Elementary’s BTSN will be held on the following day, Tuesday, Aug 19. Parents should report to the GL Johnson Chapel at 7 p.m.
Jonathan Penberthy, first time FC teacher and Co-Athletic director, is looking forward to this Monday’s BTSN. Having prior experience as a teacher and a coach in the Bay Area, he is using his experience to prepare. Dean of Students, Amy Deffenbacher, switches gears from teacher to dean of students for upcoming BTSN. Mick Fuller, Co-Athletic director and PE coach, looks forward to sharing his plans for his classes with parents. Follow The Feather via Twitter: @thefeather. This writer can be reached via Twitter: @_chloemueller. For more news, read the Aug. 14 article, Seniors prepare for retreat, look to grow closer. English teacher Greg Stobbe, center, has creates a chorus of freshmen singing “The Beasts of England” from George Orwell’s ‘Animal Farm’. The ghosts of George Orwell’s pigs have been roaming the campus hallways since the 2000 school year. 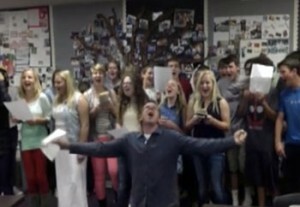 And while national anthems are routinely sung, chanted and hummed throughout the world, a classic song echoes through this high school’s classrooms each April after a week of practice in Greg Stobbe’s English room. This spring is no different. Be prepared to host a gaggle of cows, turkeys, pigs, dogs, sheep and an array of other animals as the chorus of riled up tenderfoots weave their way through both expectant and surprised rows, May 8. And if listeners dare, sing along with the greenhorn choristers during period 4. But expect nothing less than organized propaganda. The beasts are back! Orwell’s Animal Farm is the focus and the Beasts of England lyrics are its centerpiece. Listeners may have a favorite verse or may still know most of the anthem as they too survived Stobbe’s antics and passionate push to learn the memorable song. Therefore, may this serve as a warning or heads up or both. While the song may be brief, its catchy tune and lyrics often revisit the participant for weeks. Do you remember it appearing in your dreams, random humming while getting dressed in the morning, or just hearing it repeat over and over again in your head when you least expect it? This is the power of song. The Feather staff posts this practice video as a demonstration only. The 2014 freshman English class, in a friendly competition, hopes to entice you to participate with them. Be ye prepared. For those who need a reminder of past performances, watch the 2013 version as the ‘Beasts of England’ entertains campus classrooms (VIDEO). And if that is not enough, be sure to check in with ‘Beasts of England’ 2012 (VIDEO) and/or the Animal Farm: Beasts of England, 2011 (VIDEO). Listeners may also check out photos on Instagram (@thefeatheronline) and Twitter (@thefeather) over the next couple of days. You might view your favorite animal close up? Hours of heated discussions and meetings finally produced what appears today, a well-oiled machine. It was in those energized conversations that the The Feather evolved. That was 25-years-ago. Today, The Feather publishes new information every day in an online edition and a monthly hardcopy paper. After years of work, Principal Gary Schultz believes the paper has taken huge leaps towards excellence. Wilkins professes that the newspaper becomes an archive of the school’s history. Greg Stobbe, current Feather adviser, has been aiding in the production of campus newspapers since 1995. A journalism major in college, Sargent, yearbook adviser and previous Feather adviser, had a rocky start. Anyone who has ever tackled a large project can attest to the challenges that it brings. The years that Sargent ran the show, junior high also worked on the paper. Along with the pressure to excel, pandemonium is inevitable. But, even before Sargent and Stobbe, there was Mrs. Joan Johnson. Even though online editions are becoming common, Johnson still prefers the hardcopies. Johnson managed the paper for about seven years, winning the All-Valley award [sponsored by California State University, Fresno] several times. Johnson believes the paper should cover campus related materials only. Schultz thinks that the paper should showcase the school. Part of the journalism program is to assist potential journalists in making them skilled writers. Teamwork and cooperation combine to create the paper. Today, The Feather continues to win numerous awards sponsored by Columbia University, California State University, Fresno and the National Scholastic Press Association. For more information contact Stobbe at [email protected] or at 299-1695, ext. 5. To view the online paper and the archives, go to www.thefeather.com. The clatter of fingers furiously flying across keyboards reverberates around the room as students from over 100 schools throughout the Central Valley prepare to compete in the annual Muckraker High School Journalism Conference held on March 6 at Fresno State. The competition is sponsored by the Mass Communication and Journalism department at Fresno State and by the San Joaquin Valley Scholastic Press Association (SJVPA). During the day, the Feather staff will compete for individual and team awards. Students will attend seminars and compete in various events from 8:15 A.M. – 12 P.M. Students can compete in news writing, editorial writing, feature writing, advertising design, yearbook design, sports writing, newspaper design and news photography. Students who do not compete will attend various seminars. Seminars will include information about lead writing, interviewing, sports writing, music and movie review, feature writing and photography. Journalism adviser Greg Stobbe sees the conference as a way to help students advance their skills. After an hour-long break for lunch, students will attend an awards ceremony from 1-2 P.M.
For additional information, contact SJVSPA conference director Gary Rice at (559) 278-2026 or go online at www.fresnostatenews.com. At the end of each school year, adviser Greg Stobbe sends in The Feather so scholastic press associations critique and judge the campus paper. The Quill and Scroll International Honorary Society awarded the International First Place plaque to The Feather staff during October. The honor was for the for the 2002-2003 school year. Quill and Scroll was organized to provide encouragement and recognize individual student achievement in journalism as well as other scholastic publications. Their magazine carries up-to-date and authoritative information about careers in journalism and developments in the field or journalism teaching. The Society also provides publication critiques for schools that have a Quill and Scroll charter. To be eligible for a charter, high schools must publish a magazine, newspaper, yearbook, literary magazine, broadcast program or a web site. Quill and Scroll judges comment about strengths and weaknesses of a newspaper and make suggestions for a better publication. Campus journalism has been a member of Quill and Scroll since 1991. Judges for the Columbia Scholastic Press Association also critiqued The Feather in October, pointing out different problems and areas for improvement throughout the paper. “Your publication’s strengths lie in the tight, clean, visually pleasing layout design and in your good tonal range in you photos,” an anonymous CSPA judge said. “One major problem, [alluded to throughout the critique], is the tendency to editorialize–allow the writer’s opinion to come through in the quotations. It is easy to allow editorializing to happen, and it takes diligent editing to remove it from the text. 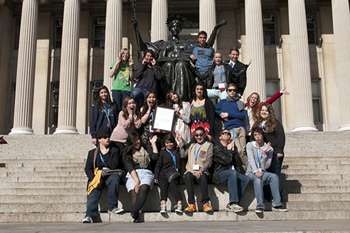 The CSPA gave the journalism staff a silver medal to their collection of awards. Eight members of The Feather staff also traveled to New York during March to attend classes at Columbia University during the CSPA conference. See the May 2003 online article “Journalism trip to NYC highlights year” by Tim Gomez in the archives for more information on the conference. Along with winning various awards, nine individual articles by seven staff writers have been recognized by the American Society of Newspaper Editors [ASNE] on the National Edition online paper in the past six weeks. The National Edition online paper is a collection of stories from across the country. Stories are chosen based on quality and the appeal to a broad teen readership. The editors look for work that adheres to sound journalistic practices. The online edition can be found at www.myhighschooljournalism.org/nationaledition. 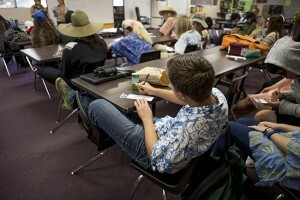 Aspiring journalists will expand their media skills at the annual “Muckracker 2003” on March 8. Hosted by San Joaquin Valley Scholastic Press Association (SJVSPA) and sponsored by the Mass Communication and Journalism department of Fresno State, the conference welcomes over 100 schools throughout the Central Valley. The event takes place from 8 a.m. – 1 p.m. at various places on the campus and competitors walk to their respective event buildings. Categories include yearbook, newspaper and advertising design, photography, news, feature, sports and editorial writing. Competing schools select two students to participate in each event and four awards are given in each category. However, some students do not compete but they can attend workshops for instruction in specialized areas. 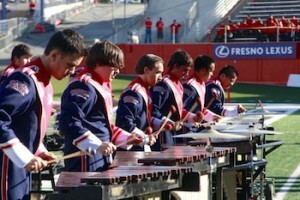 Fresno State has opened its doors to students for 23 years and this will be FC’s fifth year competing. Last year, FC took home the All-Valley newspaper award for small schools with under 1,600 students. The contests begin at 8:45 a.m. but registration for all participants opens at 8:15. For additional information, contact SJVSPA director Becky Thornton at (559) 278-6266. Student journalists from all over California’s Central Valley converged on the campus of Fresno State University on March 9 to celebrate their year. Among the day’s winners was the campus newspaper staff, as The Feather not only received a Superior rating, but also was named the All Valley Newspaper of the Year for small schools. The occasion, “Muckraker 2002,” is an annual event hosted by the San Joaquin Valley Press Association (SJVSPA) and sponsored by the Mass Communication and Journalism department of Fresno State. Over 100 schools from Lodi to Bakersfield competed in the competition. Besides giving out awards to newspapers, yearbooks and individual articles were also judged by Fresno State department heads. The half-day festivities included a variety of workshops designed to improve student journalists’ writing, editing and layout styles. Classes available to attendees included “Grammar Gremlins,” a class demonstrating the common mistakes editors and writers often make; news photography; newspaper design; and movie reviewing, taught by Fresno Bee writer Donald Munro. Some student journalists also chose to compete in on-the-spot contests. Participants were given a set amount of information and instructed to write a features piece, news or sports article, or an editorial. For some, however, finicky computers stalled their competition dreams. Editors and graphic designers were given specifics for a page or advertisement and told to design the page. Following the classes and contests, participants filled the Fresno State University Center auditorium. Following several inspirational speeches by local journalists and professors, awards were distributed to the editors, writers and yearbook staff members judged to be generating the top publications in the area. After the dust settled, The Feather staff not only received an All Valley distinction but several other writing and photography awards. Carli Albrechtson, ’02, was awarded second place in the photography competition. Judges commented during the awards ceremony that her photograph of an elderly man and a newborn colt was one of the best ever in SJVSPA conference history. The other individual award winner was Holly Deniston, ’04, whose article on depression placed third overall in the features writing category. The article can be read online in the archive section of this paper. Honorable mention went to Annie Hierholzer, ’05, for a sports article and Eric Witters, ’04, for a news article. However, The Feather did not receive as many awards as in past years, when the publication was well-known as one of the best in the area. In the 2000 Sweepstakes competition, The Feather placed second overall in the entire San Joaquin Valley. For some senior staff, the lack of individual awards received was disappointing. The Tokay Press from Lodi won the Sweepstakes competition after nearly sweeping the writing and photography awards. While the staff was disappointed in the final outcomes, many viewed the experience as a stepping-stone to better their writing. The campus yearbook, The Shield, was also awarded Superior status from the SJVSPA but did not garner any other awards. 3/18-3/19 Band to CMEA festival at Bullard H.S. High school Concert for the Performing at Veterans Memorial Aud. 5/13 Dress rehearsal for Spring concert-CC & Ensemble, 9:30 a.m.-1 p.m.
1/18 Powder puff football, 12-3 p.m.
Student tension on the last day of each quarter has been largely eliminated thanks to the innovative grade update system, newly developed Internet sites utilizing Mac School and K-12 Planet programs. 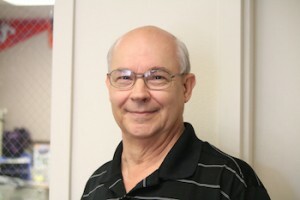 The campus web site, www.fresnochristian.com, was developed last year, and has helped parents and students stay informed on schoolwork, says Principal Gary Schultz. The person responsible for getting the site up and running was David Martens, campus computer technician. Although Martens created the site, the idea started in the mind of Superintendent Tim Wilkins, who suggested the idea to the board. According to Wilkins, about 15 students arrived on campus last year as a result of the website that online grades available push has been successful. For the parents and students to gain access to grades, they must go to the high school office and ask for their user name and password from any office authority. The parents must sign a form to get the number and password from the office. However, the password is needed only for grades, as homework assignments can be seen by anyone. According to recent polls taken in the past year, 87% of the students on campus have Internet access at home, so getting on the Internet should not a problem for families. The site is updated every day by Schultz, according to the grades given to him by the teachers. Teachers must have new grades available within two days and turn them in to Schultz to put on the Internet. For students who are planning to be absent for a large amount of time, the homework is posted on the site a week in advance. While this is an archived article, please stay online and follow The Feather via Twitter @thefeather, Instagram @thefeatheronline and Facebook @thefeatheronline. As students study for core classes this fall, many are also preparing to take Scholarship Aptitude Test (SAT) and/or the Preliminary Scholarship Aptitude Test (PSAT). Most colleges and universities use the nationalized tests to determine acceptance and placement. However, as campus prepares for standardized exams, teachers have already been preparing students. Teachers often use SAT scores to evaluate students’ abilities, as well as understand what other teacher’s taught and what may need to be taught in the future. Carl Brigham developed the Scholarship Aptitude Test in 1926, when it was administered experimentally to a few thousand college applicants. Since then, the SAT has evolved dramatically and is now used by many colleges as a requirement for applicants. The ACT assesses the high school students’ ability to complete college-level work. Niemeyer added that SATs are another indicator of a students’ ability despite what their GPA may show. Sophomores also understand the importance of the SAT. “I want to get into a good college,” Rajani Elek, ’04, said, “so I think the PSATs and SATs are a helpful way to prepare for the work. For those want more information, sample test questions are available, as well as individualized help for test preparation at sites such as www.collegeboard.com. Students can also contact Niemeyer for more information. SAT registration for the Nov. 3 test date at Fresno State needs to be completed by Sept. 28 but can be turned in late with an additional fee. The next PSAT is scheduled on campus for Oct. 16 and costs $10. A little bit of history: As of 1997, the Scholarship Aptitude Test or Scholastic Assessment Test actually is just known as the SAT and now doesn’t officially mean its formal names.